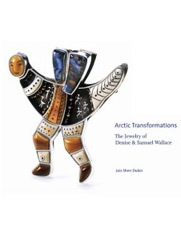 Arctic Transformations: The Jewelry of Denise and Samuel Wallace features the intricate sculptural jewelry created by Denise Wallace, a Chugach Aleut, and her husband and partner, Samuel Wallace. The Wallace’s innovative jewelry explores a contemporary style that is rooted in the traditions of Denise’s Chugach culture. Its designs are inspired by the people, animals and natural environment of Alaska. The Wallaces are storytellers who use fossil ivory, silver, and richly colored stones as their medium rather than words. “My grandmother used to tell stories when I was young, and I incorporate some of them into through my work, to express Alaska Native culture,” Denise explains. To convey the concept of movement and transformation that is central to the Wallace’s work, the book includes eight gatefolds of their major storytelling belts, all seen at nearly actual size. The other eight belts are displayed on double page spreads. Each belt is illustrated with its historic and contemporary influences as well as being grouped with the pieces that originally came from or were influenced by it. The belts, which are seen together here for the first time, are artistic and technical masterpieces.